Children start out as naturally creative, and by helping them to develop their innate creativity you will make them happier, better at school and more successful as they grow up. Creativity is about so much more than drawing a pretty picture or making a great model. Creativity is what helps your children develop the ability to see a problem from more than one angle. It helps them find one or more solutions, by using the knowledge they already have, as imaginatively as possible in a wide range of school subjects and real life situations. Creativity will help your children negotiate by enabling them to see the other person’s point of view and as a result they will be happier and more contented people themselves. As they grow up, being creative will improve their school grades and eventually help them in their jobs and with all their relationships. ...the school has other targets for knowledge learning which can displace the direct teaching of creativity per se, added to which, large classes are no match for the potential benefit of your undivided, one to one attention. So here are ten top tips for how you can help develop your child’s creativity. Be creative when you talk to them. Discuss with them the things you see together, such as television programmes, films, things that happen in your neighbourhood for example. Read to them. The best and probably easiest time for this is at bed time, it is a great routine to get into and there are some fantastic books out there. When you read, try to bring the words to life, put on accents for the different characters or read slowly and expressively. That in itself is inventive and creative, and children don’t mind if the accents are all wrong, they just love that they can imagine how the story is filled with different characters.
. . . Tell them about anything interesting that you have done or seen since you last saw them and describe the events in a way that paints a picture of the scene, use descriptive words and where appropriate describe what you felt about the situation.
. . . And finally, take them on creative outings, you don’t have to do things every weekend, but now and again go to the zoo, a museum or an art gallery. It doesn’t take much to get a kid’s creativity and imagination going. Always try to answer your children’s questions. Handled correctly and said in a way that they can understand, children can take on board the concepts behind almost any subject, and answering their questions is a way of showing them that you approve of their inquisitiveness. Children are learning machines and are naturally very curious, so even if you don’t know the answer to a question, look it up in a book or on the web.
. . . That doesn’t mean that they don’t have to think for themselves. Creativity is about batting ideas back and forth, it’s about thinking round a problem, and it’s about challenging what you know and exploring the limits. If you think that they might already know the answer to what they are asking about, then challenge them to tell you. Ask them things like: “Why do you think that is?”, or “What would be a better way of doing that?” or “Why do you think it works like that?” Be prepared to prompt them, but try to let them work some things out for themselves. It’s quite likely that you will be surprised by how clear their thinking is and how much they really know. Kids need your time. They want to spend time with you and when they are spending time with you that they know isn’t rushed, they can relax and let their creativity come to the front. Being with them, doing a project, building something or just playing imaginatively and seeing them naturally happy, is one of the most rewarding things you can do as a parent. When you spend time with them they see how important being together is and how much you care about them.
. . . A great way (and perhaps the most obvious way) to develop your children’s creativity is to make stuff with them. It could be anything from Lego models, through plastic construction kits to any other type of craft. When you start out making things together, it is likely that you will have to provide most of the impetus to get things going. Persevere, let them do as much as possible, help them out where their lack of skill is clearly frustrating them, but try not to end up doing the whole thing yourself while they idly look on, or worse still, go off and play the games console. When they are getting bored, put the project away and get it out another day when they (and you) are fresh. From a creativity point of view, the process is just as important as the end result.
. . . Don’t be put off if what you make together isn’t very good to start with. If you keep trying, the end results will get better and better as they (and you) practise and get better at the thing you are doing. It’s always said that a bad workman blames his tools, but there is nothing more frustrating than trying to do something with the wrong tools. Depending on what you plan to do, make sure that you have a small making kit ready. Whether you are going to make something from dadcando (and there are loads of wonderful projects to choose from), a craft book, or just make something up, then a few permanent marker felt pens, some rapid glue or a glue gun and a couple of cans of spray paint are all you’ll really need for most projects.
. . . Creativity doesn’t have to be limited to doing specific “creative” projects. When you go out, if you are going to be in the car or on the train, take a pad and one or two pencils with you. You do not need to take a full colouring set, because you can build creativity by taking just a black ball point pen and a red felt tip. Even if you don’t have a drawing pad handy, you can take a few sheets of computer printer paper and paperclip them to a piece of similar sized cardboard. A small amount of kit like this not only makes any journey much easier but also can provide a really nice extra dimension to the day out itself when you stop to draw one of the animals at the zoo, or something you’ve seen in the park when you sit down to have your picnic. Learn how to play the classic card games like Canasta and Bridge or Whist. All these games and types of activity require creativity and original ways of problem solving, and although some of the games can take time to learn they are very satisfying to play well. When you start out on a making project, have a clear idea of what you want to make and roughly how you are going to make it. 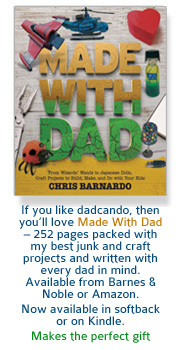 Buy a craft book, or better still download any of the 100s of dadcando projects to get you going. 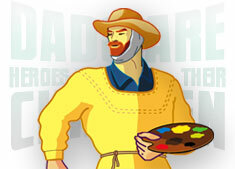 Dadcando has some of the best craft projects available on the web. Each one has been carefully worked out and has easy to follow instructions so that you will be able to recreate what we have done.
. . . 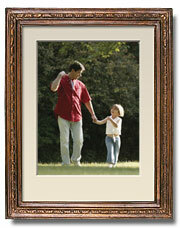 Whether you follow a premade plan or make one of your own, a plan is an essential part of doing any project. Usually kids (and most likely you) will want to dive straight in and start sticking things together. This is great instant fun but it is not developing your creativity. Working out how to solve problems and chatting through the best ways of putting things together, the best colours to paint it and the best order to do things in will give your kids invaluable experience at problem solving to get the best outcome. Even when you are following a plan, there will be problems that need solving and one of the best ways to get started on developing your children’s creativity is to follow someone else’s plan and adapt as necessary to suit your equipment, materials and skill level. Discuss any problems that you think you might encounter and work out how you are going to get round them. This may involve trying out to see how things go together before you stick them together permanently. Kid’s love to make their games real by role playing their way thorough stories and scenes that they have seen on television, at the cinema or on their console games. They will be amazed to find out, that with your help they can make items and props from their favourite stories and games and will allow them to translate the game into their real life role play versions. Things you make together are likely to be much more fun and more played with than shop bought merchandise, apart from being a whole lot cheaper as well. While there should be an emphasis on completing tasks, doing something creatively is not a race. Children participate in so many activities that are geared towards the goal of winning, that it is hard for them to understand that getting something done and solving the problems, so that the end result is what they want, is better than finishing before everyone else.
. . . In our society we are obsessed with the need to instil a desire to win in our children. In most cases this only results in turning out grown-ups who at some level are disappointed with themselves and their lives. Developing creativity is not in itself about winning. In the long run, approaching life creatively will make you more successful and happier, but when doing projects with your children, don’t make them rush to false deadlines. You can always put the stuff away and get it out next time, or if they want, finish it for them, when they are not there, so that it’s done when you next see them. When you are pleased that your child is doing something creative and you want to encourage them it is very hard not to tell them how brilliant what they are doing is, even when it is clearly not. Children are very perceptive to emotions and know when someone is saying something that they don’t really mean. On the other hand children need to feel that you approve of them and that you are proud of them. As a parent, it’s very difficult to judge how good something that your child has done really is because you have very little to compare it with. If you do a lot of craft with your children, you get to know when they are doing something that is very good and something of which they are proud and then you can tell them that it is amazing. Added to which as you work together with your children you develop a way of discussing the things that you do that it not judgemental, where you can both assess the quality of the outcome together.
. . . However, to start with, consider what they are doing in terms of their age and the amount of experience or practice they have had at it. If things don’t turn out exactly as planned and could do with improvement, use comments like “That’s great for a first try”, or “I think that that is very good for someone your age”, which are much better than any false flattery. Ask your child which bit they liked doing the most and which bit they didn’t like doing. Ask them how they could improve it if they had another go at it. During the project, if you see things going wrong, helping them with what’s causing a problem, will go a long way to improving the final outcome. Don’t wrestle the tools or project off them though, otherwise they will feel that it has started to become your project and not theirs. Offer to help. Ask them “What can I do to help?”, “Do you need me to hold something?”, “Do you need some help spraying because the button is too hard to press?” Remember, the act of making something is at least as important as the outcome. Developing your children’s creativity is about showing them how to have more ideas and giving them the skill choose the best ones to improve the outcome. There are a few classical techniques for generating and developing ideas and lines of thinking and none of them rely on negative comments. Negative comments stifle creativity. They inhibit the free flow of ideas from one person to another, because being in an atmosphere of negative comments makes most people think twice about putting their ideas forward. When this happens, vital ideas are lost and only the most insensitive individuals or those with the loudest voices get heard. To develop your children’s creativity, listen to their ideas. If you feel that they are stuck in a rut thinking over and over about the same solution that is not right, then help them build on it, develop it with them, encourage them to think round the problem from an alternative view point.
. . . If you would like to make more of the idea generating process, then you might like to try the classic brainstorming technique of writing the ideas on Post-ItTM notes and sticking them on a wall. Use a big marker to write with so that only the core nugget of each idea can be captured. Write one idea per Post-ItTM, and try to break down the ideas in to their most basic elements. Ideas might be multiple answers to such questions as, “What would be the best glue to use?”, or “What should be use for the main body of the model?”, or “Does it need to float?” As the ideas start to flow, the Post-ItTM notes can be moved about, enabling you to group the ideas together with other similar ideas into idea themes. By doing this you can see if there are areas that you have missed. When you do this with your kids, remember to keep your role as facilitator, adding ideas only to spark off new areas to consider and encouraging your children to consider the problem rigorously.